Andre Shavers was sentenced to five years on felony probation after authorities burst into the house where he was living in one of Oakland's most heavily policed neighborhoods and found a quarter ounce of marijuana. After the 2007 raid, Shavers couldn't leave the state without permission. He was subject to police searches at any time. He walked to the corner store one night for maple syrup and came back in a police car. Officers wanted to search his home again. All the while, cannabis storefronts flourished elsewhere in a state where medical marijuana was authorized in 1996. Now Oakland and other cities and states with legal pot are trying to make up for the toll marijuana enforcement took on minorities by giving them a better shot at joining the growing marijuana industry. African-Americans made up 83 percent of cannabis arrests in Oakland in the year Shavers was arrested. A new method for battling teenage opioid abuse comes not in the form of a new drug or counseling method, but in special "recovery schools" that emphasize communal support and positive peer pressure. "I was kind of robbed of a lot for five years," Shavers said. "It's almost like, what do they call that? Reparations. That's how I look at it. If this is what they're offering, I'm going to go ahead and use the services." The efforts' supporters say legalization is enriching white people but not brown and black people who have been arrested for cannabis crimes at far greater rates than whites. Recreational pot is legal in eight states and the nation's capital. California, Maine, Massachusetts and Nevada approved ballot questions in November. They join Colorado, Washington, Oregon, Alaska and the District of Columbia, which acted earlier. Twenty-nine states permit medical marijuana. Massachusetts' ballot initiative was the first to insert specific language encouraging participation in the industry by those "disproportionately harmed by marijuana prohibition and enforcement." The law does not specify how that would be accomplished. In Ohio, a 2016 medical pot law included setting aside 15 percent of marijuana-related licenses for minority businesses. In Pennsylvania, applicants for cultivation and dispensing permits must spell out how they will achieve racial equity. Florida lawmakers agreed last year to reserve one of three future cultivation licenses for a member of the Florida Black Farmers and Agriculturists Association. There have been setbacks as well. The Maryland General Assembly adjourned last month without acting on a bill to guarantee a place for minority-owned businesses that were not awarded any of the state's initial 15 medical marijuana cultivation licenses. There's no solid data on how many minorities own U.S. cannabis businesses or how many seek a foothold in the industry. But diversity advocates say the industry is overwhelmingly white. The lack of diversity, they say, can be traced to multiple factors: rules that disqualify people with prior convictions from operating legal cannabis businesses; lack of access to banking services and capital to finance startup costs; and state licensing systems that tend to favor established or politically connected applicants. "It's a problem that has been recognized but has proven to be relatively intractable," said Sam Kamin, a professor at the University of Denver Sturm College of Law who studies marijuana regulation. In 2010, blacks constituted 14 percent of the U.S. population but made up more than 36 percent of all arrests for pot possession, according to an American Civil Liberties Union study released in 2013. The report found African-Americans were nearly four times more likely than whites to be arrested for cannabis possession. That study did not report Latino arrests because the FBI data on which it was based did not track Hispanics. But a 2016 study by the ACLU of California and the Drug Policy Alliance found Latinos were cited at 1.4 times the rate of white people for marijuana infractions in Los Angeles and 1.7 percent the rate in Fresno. When you think of a drive-thru, fast food probably comes to mind. But what about marijuana? Tumbleweed Express Drive-Thru in Parachute, Colorado, is the first of its kind. After nearly a year of preparation, the drive-thru pot shop opened for business on 4/20. "Their timing couldn't have been better in my opinion, I mean everybody wants to celebrate," said Kyle Steele, a customer at the drive-thru. The Minority Cannabis Business Association has drafted model legislation for states considering new or revised marijuana laws, including language to expunge pot-related convictions and to encourage racial and gender diversity among cannabis businesses. "The people who got locked up should not get locked out of this industry," said Tito Jackson, a Boston city councilman and mayoral candidate. He suggests Massachusetts give licensing preference to groups that include at least one person with a marijuana conviction. The Oakland City Council in April voted to set aside half of medical cannabis licenses for people who have been convicted of a marijuana crime or who lived in one of 21 police districts with disproportionately high marijuana arrests. Candidates must meet income restrictions. Complicating matters is that marijuana remains illegal under federal law — a fact seen as unlikely to change under President Donald Trump. That makes most banks reluctant to lend money to startup cannabis businesses, which often must rely instead on personal wealth. An Oakland-based nonprofit known as The Hood Incubator provides training and mentoring to minority cannabis entrepreneurs. "Maybe they lack the money to get into the industry or they might have, you know, gotten arrested in the past for oh, what do you know? Selling weed. And now they can't actually get into the legal industry," said Ebele Ifedigbo, one of the group's three co-founders. Under Oakland's program, applicants who don't qualify for a so-called equity license can still get preference if they "incubate" a minority-owned business with free rent or other help. Dan Grace, president of Dark Heart Nursery, is nervous about finding a partner but ready to make the program work. Debby Goldsberry, Magnolia Wellness dispensary's executive director, said the industry is primed to change and expand. "Why? Because there's a prohibition that's been out there targeting people in our communities in Oakland, and it's very unfair," she said. Oakland hosted a business mixer this month that attracted several hundred people, including retirees who have never smoked a joint and people who served time for marijuana offenses and established cannabis businesses. 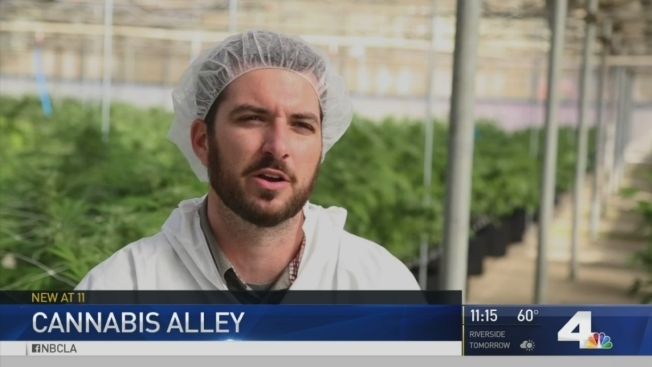 That group included Shavers, who hopes his drug-related record helps him get office space and investors to grow his delivery service, The Medical Strain. "It's a blessing in disguise," he said, "but not the blessing I would recommend." Associated Press writers Brian Witte and Julie Carr Smyth contributed to this report.